Leaping Bull - Michael Dunlop 2018 Isle of Man Superbike TT limited edition fine art print by Billy of only 500 copies and 50 Artist Proofs. 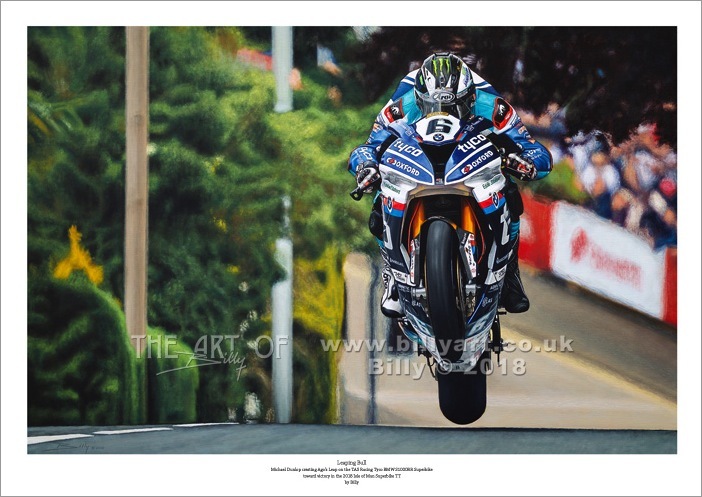 This is a brand new limited edition fine art print of Michael riding the Tas Racing Tyco BMW S1000RR Superbike in the first race of the 2018 TT festival at the world famous Isle of Man TT races. The Scene in the art is of Michael cresting Ago's Leap on the famous TT Mountain Course on his way to his 16th TT win. This limited edition print of Michael Dunlop is a giclée print on matte art paper using Ultrachrome K3 inks and each print is signed by Billy. The fine art prints of The Bull are taken from Billy the artist's oil on linen canvas painting of Michael Dunlop on the Tyco BMW S1000RR. Numbers 1-123, 126, 135, 143, 146, 148, 176, 177, 186, 200, 300, 327, 500 and others have already gone. Watch the Full HD Time-Lapse Video below. Detail close ups of Billy's oil painting below the video. Michael Dunlop 2018 Superbike TT oil painting fine art print detail 1 by Billy.